The Karno-Ruthenian nobility – Karniareichischer Adel is a status group, part of Karno-Ruthenian society, but they do not retain any specific privileges. Any noble living in the Ruthenian-ruled lands, and who owed their allegiance to the dynasty and therefore to the Emperor-King, is also considered part of the aristocracy. This applied to any member of the Karno, Ruthenian, Libertian, Horvatian, Letzembourguish and other nobilities in the Imperial and Royal dominions. Attempting to differentiate them can be difficult: a noble from Libertia, for instance, such as the Duke of Libertia, could call himself a Libertian noble, but he also rightfully belonged to the Karno-Ruthenian nobility. Two categories among the nobility may be distinguished: the Hoher Adel, the historic nobility that owed allegiance to the head of the dynasty and hold the higher titles, and the Niederer Adel, the new aristocracy, ennobled at any point by the Emperor-King and which holds lower titles of nobility. The nobility is divided into two categories: the higher nobility – Hoher Adel, and the lower nobility – Niederer Adel. The wife of the Emperor (Kaiser) bore the title of Empress (Kaiserin) and is styled “Her Imperial and Royal Majesty”. The widow of the Emperor bore the title of Empress Dowager and is styled “Her Imperial Majesty”. The children of the Emperor bore the title of Archduke of Karnia, Prince Royal of Ruthenia, Bessabia and Horvatia and is styled “His Imperial and Royal Highness”. The eldest child of the Emperor, regardless of gender, will be the Heir to the Throne. The Heir to the Throne bore the title of Crown Prince of Karnia, Ruthenia, Bessabia and Horvatia and is styled “His Imperial and Royal Highness”. Agnates of the Imperial Family and their authorized consorts bore the title of Archduke or Archduchess (Erzherzog or Erzherzogin) and styled “Imperial and Royal Highness” (Kaiserliche und Königliche Hoheit). The children of Archdukes and their authorized consorts bore the title of Archduke or Archduchess (Erzherzog or Erzherzogin) and styled “Imperial and Royal Highness” (Kaiserliche und Königliche Hoheit). Legitimate but morganatic descendants of the Imperial Family excluded from the line of succession might sometimes receive lesser titles with noble rather than royal prerogatives. Duke/Duchess (Herzog/Herzogin), styled “Highness” (Hoheit). Prince/Princess (Prinz/Prinzessin), styled “Serene Highness” (Durchlaucht). Margrave/Margravine (Markgraf/Markgräfin), styled “Illustrious Highness” (Erlaucht). Count/Countess (Graf/Gräfin), styled “Illustrious Highness” (Erlaucht). 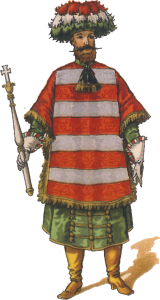 Baron/Baroness (Freiherr/Freifrau), styled “Gracious Lord/Gracious Lady” (Gnädiger Herr/Gnädige Frau).